The Panasonic Lumix DMC-FS45 is an affordable ultra-compact camera with a 16 megapixel sensor, a 5x 24-120mm Leica lens with a fast aperture of f/2.5 at the wide-angle setting, Mega OIS image stabiliser, speedy auto-focus and a variety of special effects. 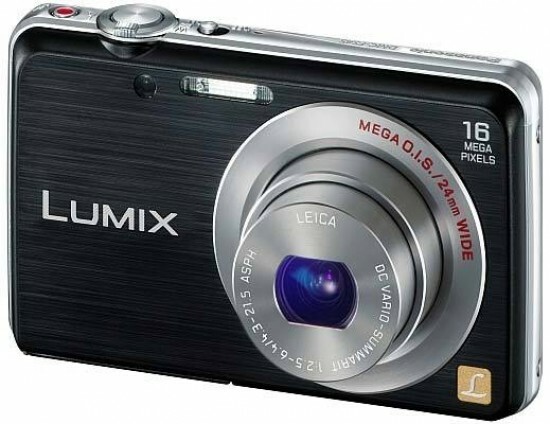 The Panasonic Lumix DMC-FS45 is available in black, silver, red and violet priced at £119.99. If you're into slim, good looking digital compact cameras that don't break the bank, the Panasonic Lumix DMC-FS45 may have already caught your attention. The front looks like any other Panasonic camera more expensive than this. The 5x optical zoom sits flush with the body and only the design of the surrounding bezel creates a ripple in the smooth fascia. A slim flash and AF emitter sit at the top of the camera close to the middle while the lens is slightly off-centre. On the top of the camera, Panasonic have opted to use switches on the FS45 for a couple of features, the power switch being one of them. This is a great way of avoiding powering the camera off by accident. There's zero chance of you mistaking a switch for the shutter release button which is located directly next to it. A small video record button is on the left shoulder of the camera. It sits out of the way for accidental pressing but it's diminutive size does make it difficult to end video recording without getting a shaky cut. A ring of chrome separates front from back. The back is dominated by the large 3inch LCD screen. Small buttons sit to the right of the screen and the second switch is found here. It's used to flick between shooting and playback. The useful part of this is you can switch it to playback while powered off, flick the power switch and look at your pictures without having the lens out. The top button accesses the shooting modes available to you. A small thumbnail menu is presented when pressing the button. IA is Panasonic's Intelligent Auto feature. It analyses the scene and selects the correct mode to suit. For example, if a person is in the shot, it will select portrait mode, select an aperture to suit portraits, turn the flash on with red-eye reduction and switch on face detection focus. The red camera is the Auto mode. This is the simple point and shoot option. The camera will still do everything for you, as long as you turn up and tell it what to do. Three notable features on the Panasonic Lumix DMC-FS45 swings us back to the front of the camera to concentrate once again on the lens. It's a Leica named lens (we choose our words carefully as the lens isn't made by Leica but is indeed made by Panasonic, to Leica specification and under their watchful eye. The 24mm wide-angle view means vistas are much more possible while the f/2.5 aperture allows the camera to let more light in during low light situations. This will, in turn, speed up shutter speeds and prevent camera shake without boosting the ISO which can damage image quality. 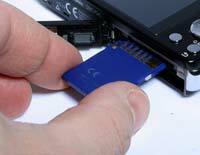 To aid this beneficial feature, the camera is also fitted with MegaOIS. This is Panasonic's Optical Image Stabiliser. Better than a Digital Image Stabiliser, the optical versions steady the lens or sensor and don't simply crop into the image. The Panasonic Lumix DMC-FS45 is built to a high standard. The casing is metal with lashings of chrome trim. We've already mentioned the notable name on the lens and the screen sits flush to the camera body. There are a number of ways to see a sign of good quality and that's one of them. The switches are firm yet responsive and the buttons are the same. They're maybe a little bit too small but that won't be the case for everyone. The icons on the buttons won't be seen very well in the dark as they've been carved into the actual button, which is a shame. Disappointingly, the USB port is covered by a light grey plastic door on a floppy hinge but on the plus side, the battery door is locked and reinforced with some metal - albeit sparingly. There are two menus on the Panasonic Lumix DMC-FS45; the Main menu and Quick menu (Q-menu). The latter is a fast access menu that allows you to access the basic functions of the camera designed to alter and improve your shot such as ISO, white-balance, resolution, focus modes, burst modes, video recording resolution and LCD settings (it's useful to boost it when you have the screen up above your head or below your head height. The screen will be easier to see if you brighten it). The Main menu button is located in the centre of the navigation pad. It pops up three sections that you can go into: Record, Motion Picture and Set up. The first section allows you to make more definite changes to the camera. There's still the options found in the Q-menu at the top but scrolling down reveals other features such as the colour filters, red-eye removal, image stabiliser, etc. In the Video menu, there's only two modes for the video quality and the option to turn continuous focus on or off. This latter option is useful if you're filming something stationary as the focus may keep shifting in and out. Finally, the Set up menu is more of the core features of the camera such as Date & time, World time, LCD display, Sleep mode, Auto review and Reset all. The menu is easy to operate. It has a white background with black lettering and a yellow highlighter. It looks pretty basic and it could only be down to the colour code. It could also prove problematic for anyone sight impaired. In some cases, the white background may bleed over the black lettering making it difficult to see. From a cold start, the Panasonic Lumix DMC-FS45 managed to get the lens out, focus and take a picture in a fraction over two seconds. That's around half a second faster than other digital cameras we've tested lately. This is likely down to the faster focusing system because it certainly does seem to operate faster. There are three continuous shooting modes: Continuous, with flash and Hi-Speed. Continuous mode took 13 pictures in a 10 second time period. That averages out to 1.3fps (frames per second). Not a bad performance and it was ready to shoot again a few seconds later. Hi-speed lowers the resolution to a measly 3 megapixels although the good news is that it shoots around 9fps. The Flash burst mode will shoot around a frame every second. It will fire the flash each time too. As we mentioned before, you can power the Panasonic Lumix DMC-FS45 on with the switch in the Playback position and view pictures you've taken without the lens popping out and risking unnecessary damage. Pressing the DISP button will scroll the various ways of looking at the pictures such as with or without information. When a little yellow arrow appears in the bottom left corner, pressing up on the pad will open two options to Auto Retouch or Beauty Retouch (for portraits). Choosing either will apply changes and show you a preview with On or Off. Choosing On will save a new version of the picture. The original will be retained. Pressing the Menu button, there's still the option to go into the Set up menu if you desire. Going into the Playback menu will open up three pages of options. In here you can Choose a set of pictures to upload to your computer the next time it's connected, resize images, crop, print a set of pictures, protect them from accidental erasing or copy them to internal memory and vice versa. In the box, the usual bag of mashings are provided. The camera is in there along with a rechargeable lithium ion battery and charger. There's a wrist strap and quick start guide. The full instruction manual is provided on the CD along with PHOTOfunSTUDIO 8.0 editing software and a Loiloscope trial.